Your term or graduation paper deadline is around the corner. There are still hours of online research to do. How do you focus on your writing instead of wasting time bookmarking tons of sites, copying & pasting to a long Word document, and printing stacks of paper? 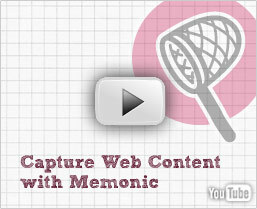 Memonic offers you plenty of shortcuts to capture and work with any type of digital content during your college finals. Plus we offer a student discount for our Premium accounts.